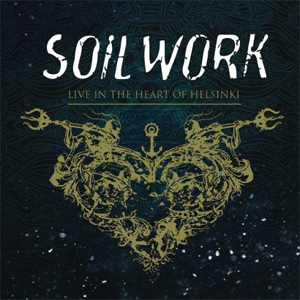 Due out on March 13th, SOILWORK have unveailed the cover art and track list for their first ever live DVD/Blu-Ray, Live In The Heart Of Helsinki. Commented singer Björn "Speed" Strid: "We’re very proud to present the artwork for our upcoming live DVD/Blu-Ray! Once again we collaborated with Mircea Gabriel Eftemie to create visuals that would perfectly capture the unique vibe of this very special evening. In The Heart Of Helsinki is somewhat of a testimony of our career and the live action shots are mixed with a blast from the past, including a collage of SOILWORK memorabilia. I’ve always loved collages, especially on the inner sleeve of a vinyl. As for the cover, we wanted to capture that melancholic wintery feel that the Swedes and Finns have in common- not just emotionally but also culturally. It was appropriately cold during the big night and Mircea did a fantastic job recreating that eerie, magical feeling. Last but not least, don’t forget to read the liner notes! They tell the story of where we came from and where we are today. It will help you understand why it’s taken so long for us to finally get a live recording out. But hey, it’s only a matter of weeks now! We hope you’ll enjoy it as much as we do!" The DVD was recorded during the band's special Helsinki show on March 21st, 2014 at Circus Club in the Finnish capital and features guest appearances by Floor Jansen (NIGHTWISH, REVAMP) and Nathan J. Biggs (SONIC SYNDICATE). Commented Björn: "There could've not been a better time than now, with 10 albums out and a very varied back catalogue to choose from. Our line up now is 50 % original members and 50 % fresh blood, which makes it all more interesting. Especially since the newest members have brought so much to our sound and have continued to inspire us to write new and exciting music and also brought a new found energy on stage. Now is definitely the time to see us. Trust me." Live In The Heart Of Helsinki will be available as DVD/2CD and BluRay/2CD. The Nuclear Blast Mailorder Edition will contain an exclusive lanyard. Pre-Order your copy HERE.